Gather your ingredients. Heat the oven to 450 F.
Slice the red onion into four large rounds, peel & slice the carrots, chop the asparagus into bite sized pieces and slice the grape tomatoes in half. Place all these vegetables along with the sliced mushrooms and whole garlic cloves in their skins on a large baking dish. Whisk together 3 tablespoons extra virgin olive oil, 1 tablespoon fresh chopped rosemary leaves, 1 teaspoon salt and fresh ground pepper. Drizzle all over the vegetables. Roast vegetables in the heated oven for 20 minutes. Remove from heat. 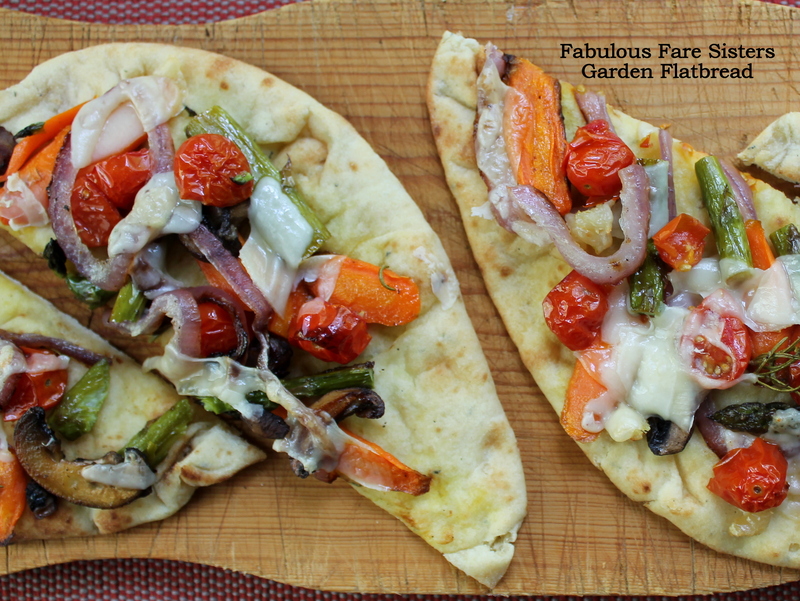 Brush some olive oil on each flatbread – I use Stonefire Garlic Naan Flatbread and divide the roasted vegetables equally among the four flatbreads. Top with fresh shaved Parmesan cheese. 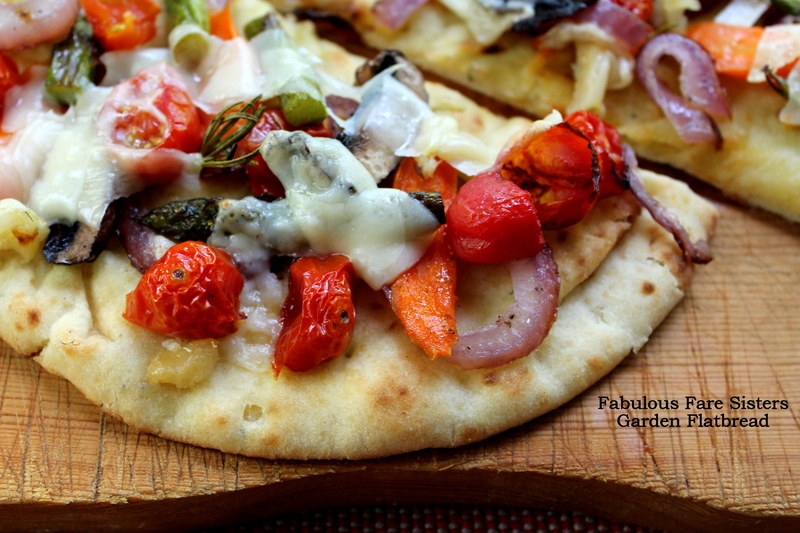 Place flatbread back in the oven for 5-7 minutes until cheese has melted and flatbread is nice and warm. Delicious! This recipe has been shared on The Pin Junkie, Senior Salon, Throwback Thursday, Foodie FriDIY, Freedom Friday, Funtastic Friday, Fiesta Friday and Saucy Saturday…go check it out and then visit some other great sites! Stop that! Now you’ve gone and made me hungry. This recipe looks so healthy, so lish! I’m more into to meatless days all the time! The fresh rosemary is so delicious with bread and in bread! YUM!!! I’m definitely going to try this tomorrow. I have a fridge full of veg and I was just thinking that it’s too hot for soup. Thanks. So nummy! LOVE naan pizzas! This is what I’m talking about!! Well done Linda, this looks so freaking good! Yum! What a deliciously healthy idea. Very yummy looking Linda… It makes me excited for the summer garden! This is great! 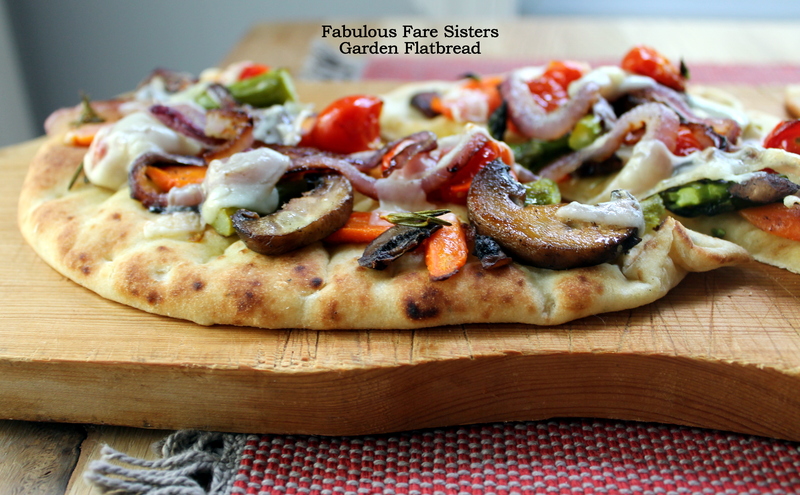 Flatbreads are so versatile and roasting vegetables is the best! YUM! That would have gone perfect with the sauce and meatballs I made last night. I wound up making a rather boring toasted garlic bread. This would have been MUCH better. So true! It makes a great appetizer or lunch too!! (I actually made this three days in a row!) 😀💕😀 let me know if you try it Gayle – it is just so darn good! !